Got up before dawn, had a quick breakfast, then set off down the track carrying a rucksack of camera gear and a heavy tripod. 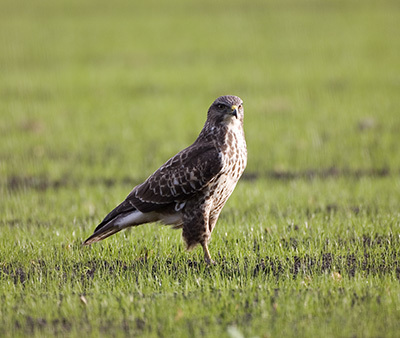 When I got to the field where I had seen the buzzard, there was no sign of it, or anything else. I crossed the field, then the far fence into the narrow strip of woodland alongside the railway. I set up the hide in the shade of the trees and settled down inside. 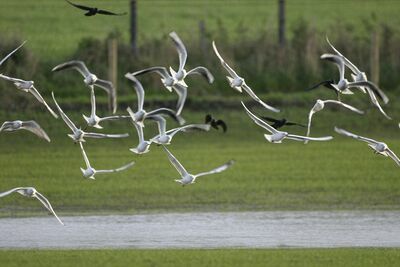 The first action was a flock of black-headed gulls, disputing possession of a strip of standing water in the field with a crowd of jackdaws. After a while they came to an agreement to live and let live, and I was surprised when they all took to the air after a long period of relaxation around and in the water. About ten minutes later, I could see a movement of something in the field, obscured by tree branches and long grass stems along the fence. The bird moved across until I could see, to my delight, the buzzard that I was looking for. I wondered whether the departure of the gulls had been caused by the arrival of the buzzard, but later, I realised the reason for their alarm. 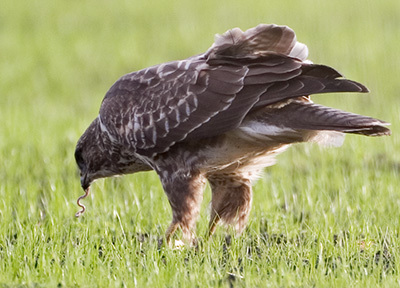 The buzzard had a definite prey in mind. It stood, glaring around, occasionally distracted by the song of birds in the wood around me. The buzzard wandered around the field in front of me, sometimes obscured by bushes or fence posts along the edge of the wood. 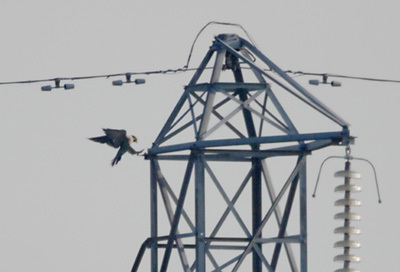 During a lull when it was impossible to see the buzzard, I scanned the surroundings with my long lens, including, some distance away, an electrical pylon. It became clear what had alarmed the gulls and jackdaws - a peregrine stood on the tall tower, surveying the fields below. 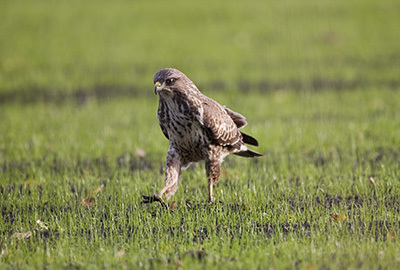 My session with the buzzard came to an abrupt halt in dramatic fashion. Another buzzard arrived and buzzed the first one, which flew away a few yards and stood its ground. The new arrival glared for a few seconds, then charged forward menacingly. Both took to flight and flew off across the wood. It is always tempting to interpret animal behaviour, but it is rare that we can be sure of what goes on between creatures in the world around us - difficult to understand human beings sometimes. 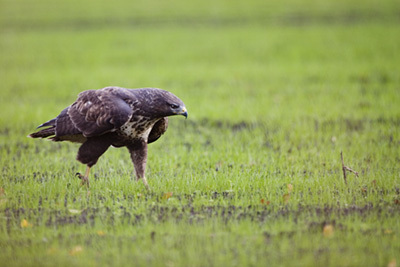 Was the second buzzard a parent of the original bird? Had it been sitting in the wood above me, listening to the click of the camera and watching the movement of the lens protruding from the hide? It may then have chased off the callow youngster for its own safety. 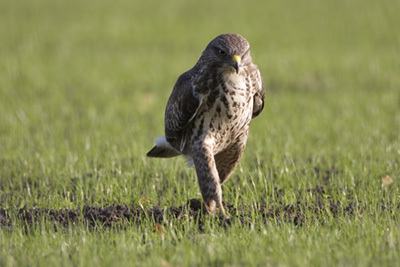 On the other hand, perhaps it was the buzzard which I had seen exploiting the easy pickings in the field previously, and it was defending its territory? I have been seeing these buzzards frequently since the late summer, and maybe I will see more of them at close quarters from my hide through the winter. However, I'll be lucky if I can ever answer these questions.